5915 15th Ave NW Seattle, WA 98107 BOOK ONLINE! what do you love about the wax bar? I love our great team of waxing specialists and our reputation for providing excellent services and a wonderful experience! The Best thing about my job is the opportunity it provides me to meet new people everyday, and the chance to see my regulars and make everyone feel good when leaving. what are some of your favorite skincare products @ the wax bar? My favorite product has to be Tendskin for waxing after-care and Dermalogica Super Rich Moisturizer. 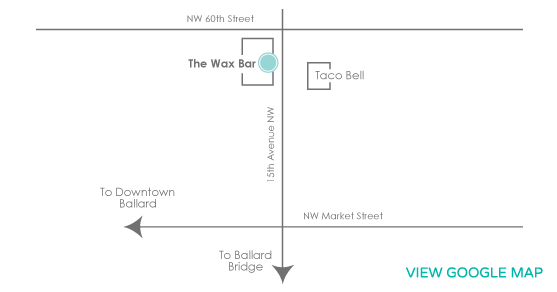 if you weren’t working @ the wax bar, what would you be doing? I would be a teacher because I love to help people grow and achieve their goals. I was born and raised in Ballard. I have always loved the community and we were very excited to open our first location in Ballard. I have been waxing for over 20 years. My family includes my husband, daughter and son and we still have not left Ballard! Most of all the people. The clients as well as my coworkers are always a joy. I also love the skincare lines that we carry and find satisfaction improving clients skin in meaningful ways. With today’s busy schedules I love being the person that can slow the day down a little for you. Even a brow wax can be a relaxing break and just the thing you needed. I love the entire Somme line. Thank you Somme for making Neckline! After skipping sunscreen on my neck and chest for the better part of my life you can see the damage. However the Neckline cream and the entire Somme line have made a big difference! Definitely something with people. Probably teaching elementary school. Teaching children to read would be very rewarding. After taking a couple of years off from The Wax Bar to live in China, I am very excited to be back! Seattle has always been my home and I truly love this city! This is a fabulous place to work, we have an awesome, funny, supportive and professional team of women. I love the clean and classy environment and always changing boutique items. Oh, and we offer drinks! What’s not to love?! It is incredibly rewarding to connect with clients, even if it’s simply for a 10 minute brow transformation. I love the instant gratification of hair removal with the possibility of making some one feel better leaving than when they arrived. I’m a huge fan of Revitalash, this amazing product really grows your lashes and makes them look long and luscious. I also love the universal brow pencil for filling in the sparse brow areas. I’ve noticed a marked difference in my skin since being a die-hard Dermologica user. I started using PCA eye cream and it is the best I’ve ever tried. Invest in your skin, you only have one face. I’m really interested in nutrition and holistic body care so I’d probably go to school for nutrition counseling or naturopathy. I’d like to get my Reiki master certificate and practice that too. I love what I do now so no career change for me anytime soon. I was born and raised here in Seattle and outside of a stint in Israel, I’ve lived here my entire life. I graduated from Seattle University with a degree in Social Work/Sociology but found my calling when I went to esthetics school a few years later. I love music, travel and art and making jewelry in my spare time. My husband and I live in Magnolia near Discovery park with our joyful toddler. Everything from the fast paced, energetic people to the excellent service we provide. The goal is always to deliver outstanding treatments to our clients. I really enjoy getting to know our clients. Everyone is unique and that is what keeps it interesting. I also really care about my co-workers, we all work together so well. I have fallen in love with Dermalogica Age Smart line in particular the Skin Resurfacing Cleanser (anti-aging and exfoliating cleanser) and Super Rich Repair (enhancing firmness and elasticity moisturizer). Just a few products that can really make a difference to your skin! I love seeing the world with my family so I would like to write travel guides for families. I lived in West Seattle for the last 16 years along with my husband and two children. We love to cook, travel and hike! I have also been a licensed esthetician for the last 16 years. I love coming to work at such a beautiful spa everyday and knowing that I’m working with such an amazing staff. We all love what we do, take pride in offering the best service possible, and support each other. I couldn’t ask for a better work environment. The best thing about my job is the interactions I have with my clients. You never know why someone is getting the service they’re getting, and I love hearing about their lives and helping them feel beautiful. It’s amazing the sense of relief you can give someone just by doing something as simple as a lip wax. I’m also a little OCD, so waxing is the perfect career for me! Tend Skin for waxing aftercare. It’s amazing how using it consistently can help prevent and heal ingrown hairs. Second would have to be Dermologica Intensive Eye Repair. I think that eye cream is one of the most underrated skin care products, yet it’s so important. TWICE A DAY PEOPLE! I would be a stand up comedian, a baker, a full time dog foster parent, or a powerhouse lawyer. I’m an old soul, I love the good ole days, fashion, music, etc… Most of my free time is spent cooking, laughing, listening to old country music, and taking care of the people I love, including my dog, Kevin. I love working here for the laid back and classy atmosphere it has. A great bonus would be all my co-workers are genuinely kind and awesome to be around. We have a great team! I love meeting new clients daily and getting to see them happy after the service as well as helping them achieve their skin care goals. Oh man, a few! I love the Antioxidant Hydramist from dermalogica, it’s refreshing as well as it balances your skin using powerful peptides. I love the Somme transport pads because it’s filled with vitamins and glycolic acid to exfoliate and smooth the skin. Our PCA Peels are wonderful as well, especially if you’re looking for a quick treatment! I’d be a veterinarian, I love all animals, especially dogs. Dogs love facial massages too! I grew up in Everett and have never lived outside this state. I own 2 small dogs, love wine tasting, going to concerts and the theater. I have a goofy personality and enjoy shenanigans. I also love spending time with my family and friends. I love the atmosphere! I love how classy it feels here. The decor is beautiful, the treatment rooms are candlelit which feels calm and serene. The best thing about my job is the opportunity to help people feel more confident about the way they look. It’s also cool that people are almost always nice to me because they don’t want me to hurt them. Haha! That works out great for me! Just sayin’! what are your favorite skin care products from the wax bar? I love Dermalogica’s new Nighttime Cocoon it smells subtly of lavender and helps me have a great night’s sleep and my skin looks noticeably more hydrated and youthful. Laying in a cozy bed with 10-15 puppies. I have a two-year-old daughter and when I’m not working my life is all about being the best mom I can be right now. I am pretty new to the city of Seattle. I come from Eugene, Oregon where I grew up and went to college at the University of Oregon. I have a very sensitive spot for animals, especially cats and I can never pass up an opportunity to travel. I love my awesome co-workers, they make the job even more enjoyable and fun and I have built many meaningful friendships here. I also love the skincare that we carry, and being able to try them out and improve my skin in ways I hadn’t known about before. The most exciting aspect of my job is the fact that I get to help bring in the fun retail that we carry. It is always fun to see what new items there are, and being able to keep up on trends. Hands down, Somme Eye Cream! I was using a different eye cream for the better part of my life and once I tried theirs I was converted. It has even lead me to try other products in their line and I haven’t been disappointed. I also use Somme A-Bomb as my moisturizer. In my spare time I love to watch and play sports, hang with friends, and explore the city. I also enjoy sports writing and cover the NBA and NFL.